Moonshine is one of the terms that are used to describe the high proof distilled spirits that are usually produced at people’s home in the southern parts of the USA. 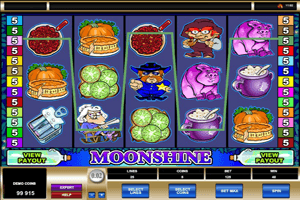 The game is themed around that, this is why players can expect a fun and an exciting slot gaming experience as they help people make their own moonshine while avoiding getting busted by the police. The game has a simple format of 5 reels and a total of 25 paylines that online players can place their wagers on. These bets are placed at the bottom underneath the reels as players select the lines they want to place coins on as well as the number and the value of these coins. The symbols include a police officer, an old lady with a shotgun, moonshine, sardines, a bonus potion, homemade food and more. The bonus potion is the scatter icon that has the ability to trigger from 3 to 5 free spins, it depends on the number of bonus potions that appeared on the reels. The number of the symbols is the same number of the free spins that are awarded. The police officer is the scatter icon that can give players scattered payouts. The old lady with a shotgun is the wild icon that will replace other symbols anywhere one the reels with the exception of the other 2 bonus symbols, the police officer and the bonus potion.